I’ve mentioned previously how I’m not particularly gifted at imaginative play or general silliness but as Caterpillar is growing I’m finding myself really enjoying the more educational and developmental side of play. He’s recently been receiving homework from nursery, and although it’s madness really since he’s just turned three, I’m finding it’s something I’m really enjoying doing with him (it must be my inner geek!). He is constantly surprising me with his counting, alphabet and colour abilities and it’s really fun interaction for us. 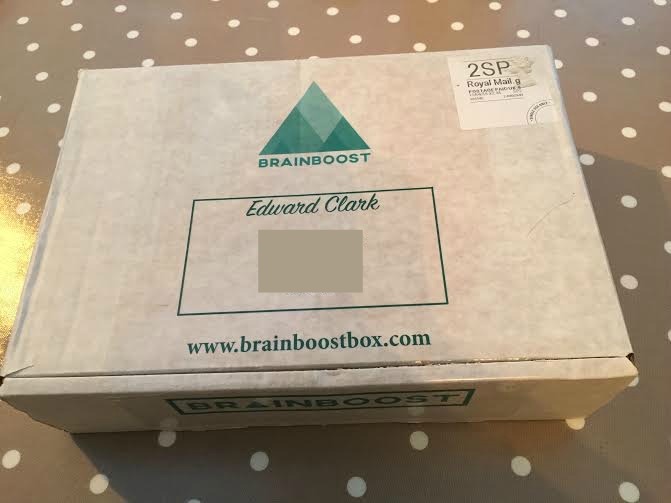 When I spotted Brainboost subscription boxes online they seemed right up our street. 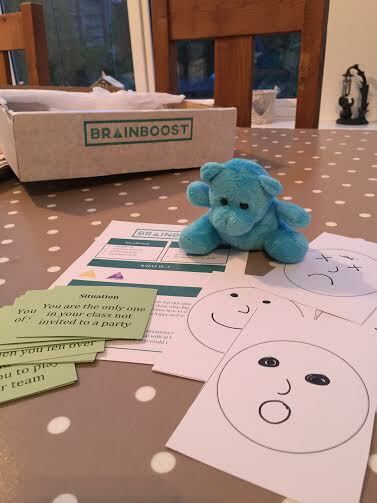 Brainboost is a subscription box service offering a really wide range of games and activities aimed at developing your child academically & emotionally, whilst still being really fun and engaging. The company was started by Child Development expert Dr. Maryhan Baker following her work with a parent and child group called Developmental Play,where parents played her scripted games, which promoted the children’s development. Parents starting asking Maryhan to write her games up and put them in a kit for them to play at home which led to Maryhan setting up Brainboost. 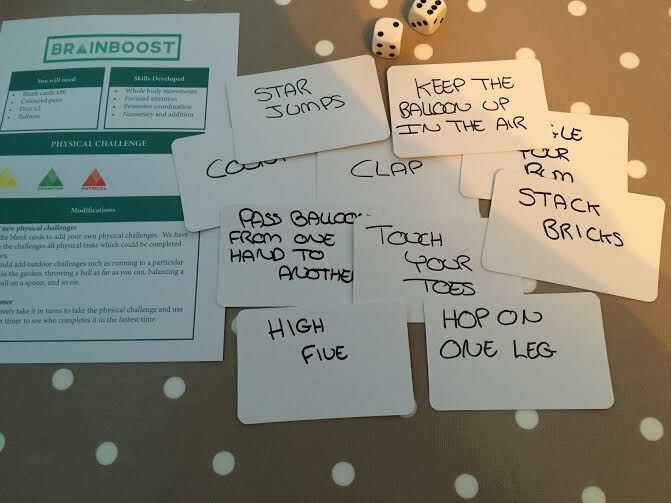 You can find out more about the methodology behind Brainboost from this useful video from Maryhan. I was really impressed with our box. First off, it comes address to your child which is great fun because what kid doesn’t like getting packages in the mail? I was really surprised with how much was in the box – ours contained six activities in total plus an activity book. The games cover a huge variety of skills from emotional intelligence to counting & numeracy and creative writing, all geared towards your child’s age and development level. 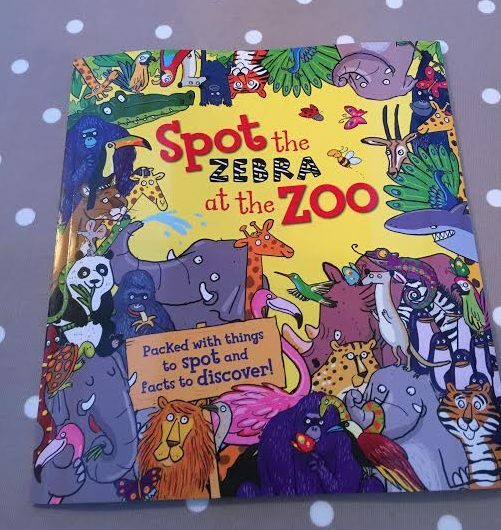 Spot the Zebra at the Zoo activity book – Caterpillar loved this as he is a huge animal-lover and he really enjoys picking out objects. The illustrations are really detailed with wonderful colours and very specific items to spot which make it challenging in a great way. Mummy/Daddy Says… activity – a game Caterpillar has recently got into so this went down very well. Word Making – a description game where your child should identify what you’re describing and then use the letter cards provided to try to spell the word. This was a little too difficult for Caterpillar however we are doing a lot of alphabet work at the moment so it really helped to familiarise him with the letters and sounds. Top Trumps – this is the ‘project’ activity. You are provided with blank top trumps cards to illustrate and decorate yourselves and a Deadliest Animals Trumps statistics sheet. We haven’t started this project yet but I’m looking forward to it since Top Trumps is such a classic and I like the idea of this do-it-yourself version. Physical Challenge – this involved writing a series of simple instructions on the blank cards provided (some are suggested on the instructions and others you can make up yourself). Your child picks a card to determine which action they have to complete and then throw the dice to find out how many times they need to do it. There are also balloons included as some of skills involve passing the balloon from one hand to the other etc. Caterpillar enjoyed having me pick out cards as well so I got a little physical work out as a bonus! Story Telling – Using the blank dice provided, you and your child decorate using the stickers and colouring pencils and create four different dice – one listing objects, one characters, one places and the last events. Then your child throws the dice and creates a story using the results that appear – e.g. Lilly visited her friends at the park and brought her dog with her etc. Again, I’m looking forward to helping Caterpillar to practice with these going forward as it’s a great tool for speech development, word recognition and imagination. What if…? – I really love the concept behind this emotional intellgance game. Using scenario cards and happy/sad/angry/surprised etc faces (which your children draw and decorate themselves) you ask your child to indicate how they would feel in certain situations. A fab idea and Caterpillar really surprised me with his quick grasp on this one. Each activity comes with detailed instruction on how to play plus a list of the skills it helps to develop, there are also modification options if you want to make the game more challenging. I must admit that even though Caterpillar is 3, and therefore right in the middle of the 2-4 age level box we were sent – he struggled a little with some of the tasks. However, it’s good for children to be challenged plus I found I was able to adapt some of the games myself to suit Caterpillar’s level and we can then work upwards from there. 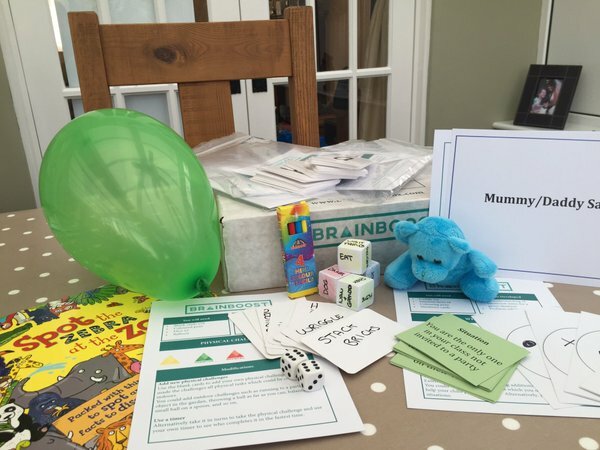 We had a lot of fun with the activites and it really encourages positive interaction between parent and child, not to mention keeping my own brain occupied too! The boxes could work well in a school or nursery environment as well. My only criticism is that the products are a little bland in appearance which is probably not a problem for older children but 2-4 year olds might enjoy some bold colours & fonts and perhaps some illustrations. On the plus side, I love that most of the games allow some form of customising from the children (drawing faces, colouring in dice etc). The price is £20 per month (one box), reducing to as low as £18 depending on the length of your subscription, and this hits about the right mark in my opinion as there are lots of tasks included and you can see a great deal of work and research has gone into each box, you can also add extra materials at a reduced price for siblings. The website is really clear and easy to use and, in addition to the UK, Brainboost now also ship to Europe & the US too. I really love this concept as it’s so unique, I don’t believe there are any other subscription boxes available at the moment with the same range of products included. To subscribe Brainboost simply visit their website or find them on Facebook or Twitter. Disclosure: I received the one Brainboost Box in exchange for an honest review. Content and opinions are all my own. This looks really good value for money and it’s great that children can personalise the resources themselves. What a great idea for a subscription box…Educational and fun too! This looks great, what a fab idea of a subscription box – lots and lots of fun! Colette recently posted…Win Love2Shop vouchers with DFS and your #SofaMoment! Oh wow this looks brilliant – so many activities that are simple to do but really effective. Especially good for wet weather holiday days! I think we might get a box to try it out! Thank you.